Pneumatic Manipulator Arm is used for loading and unloading heavy glass. It is very safe and easy to operate, and labor saving. The pneumatic glass transfer arm (the manipulator/vacuum glass lifter/lifting device) are completely pneumatic balancers for capacity up to 300kg including lifting tool. Different models are available for the special requirment of the customer, and different supports, such as column, ceiling, overhead rails mounted. Looking for ideal Pneumatic Manipulator Manufacturer & supplier ? We have a wide selection at great prices to help you get creative. 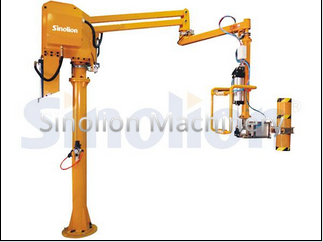 All the Industrial Manipulator Arm are quality guaranteed. We are China Origin Factory of A Portable Robot. If you have any question, please feel free to contact us.